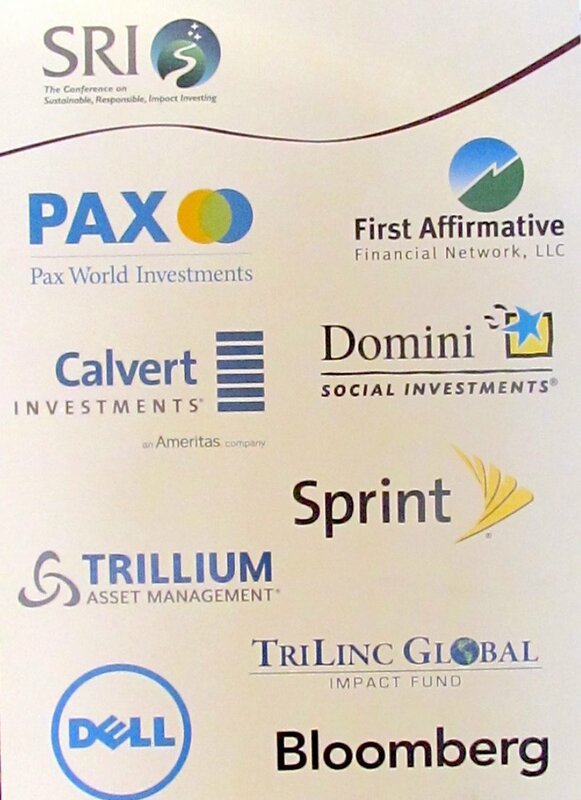 The 25th annual SRI Conference on Sustainable, Responsible, Impact Investing was held November 9–11, 2014 at The Broadmoor in Colorado Springs. I’ve been working with many of the organizers, sponsors and participants for years but this was my first time to the SRI annual conference. I attend a lot of conferences every year but this one was the most fun — and probably the most informative. I’ll be back. In fact, I’ve already blocked out November 3-5 on my calendar for next year. This is the first of a several part series on the conference. I apologize in advance for the some of the bad photographs that will be included in this series of posts and for the cryptic nature of my notes. All I can say is the lighting was tough on my low-cost camera and amateur abilities. With regard to the cryptic notes. Sorry, I have too many other tasks at hand to edit my notes into finely tuned flowing posts. 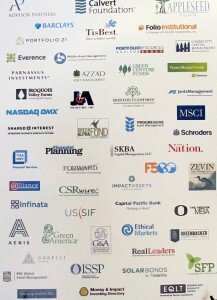 As “the premier North American conference for the sustainable, responsible, impact (SRI) investment industry,” the SRI Conference offers attendees many opportunities to meet and learn from passionate, creative people from all corners of the responsible investment community in the United States and around the world. 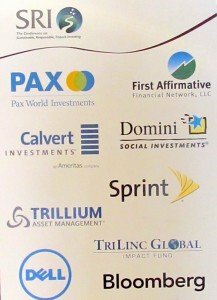 The conference has been owned and produced by First Affirmative Financial Network since its inception in 1990 in collaboration with many other organizations that serve responsible investors. Hundreds of financial professionals and industry practitioners attended The SRI Conference at The Broadmoor. Most roughly come from the following groups: 1) licensed investment professionals serving investor clients; 2) SRI mutual fund companies, asset managers, social research organizations, and other product/service providers to the industry; and 3) investors, nonprofit organizations including community development banks and credit unions, faith based organizations, and other groups that work with investors on various social change initiatives. As I recall, about 260 of this year’s attendees were first-timers. We all learned a more about how to make money and make a positive difference with money — at the same time. Sustainable, Responsible, Impact (SRI) investing is the process of integrating personal values, societal concerns, and/or institutional mission into investment decision-making. SRI considers the investor as a real person, not as a robotic form of homo economicus. It’s an investment process that considers the social and environmental consequences of investments, both positive and negative, within the context of rigorous financial analysis. SRI portfolios seek to invest in profitable companies which stand above their peers based on analysis of environmental, social, and corporate governance factors (commonly referred to as “ESG”). Sustainable, Responsible, Impact Investing is thriving in the United States; and it’s grown at a faster pace than the broader universe of all investment assets under professional management since 1995. 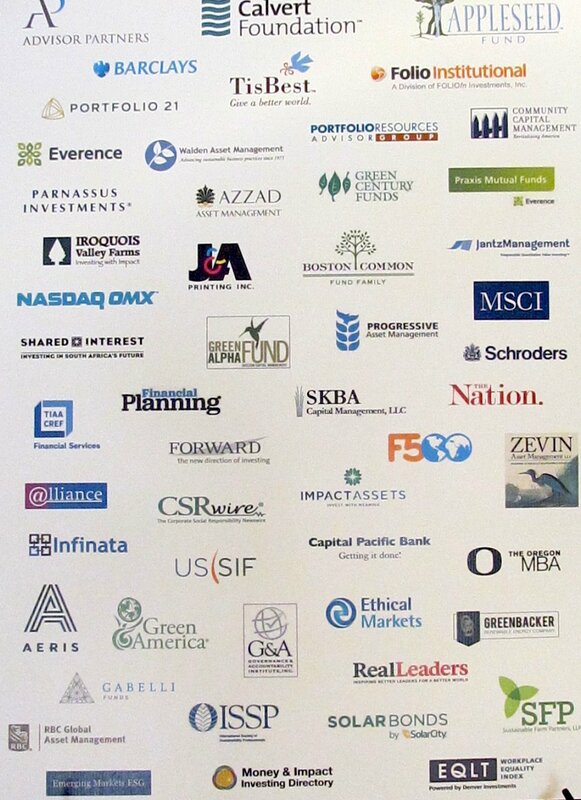 According to the 2012 US SIF Report on Sustainable and Responsible Investing Trends in the United States, approximately $3.74 trillion in total assets under management are invested using one of the three core SRI strategies—ESG integration (environmental, social, governance), shareowner advocacy, and community impact investing. SRI / ESG assets represented 11.3% of all investments under professional management in the U.S. in 2012. US SIF is conducting research and anticipates releasing its 2014 Trends Report in November / December of this year. 260 1st time attendees. 1/2 of all the attendees at the Conference. For Steve Schueth, President, First Affirmative Financial Network, Host and Producer of the SRI Conference, it was his 23rd conference. SRI changed from Socially Responsible Investment about 6 years ago with the switch from Socially to Sustainable. Investment changed 3 years ago to Impact. I’m not sure why it isn’t SRII but wait a few years and the name will probably change again. Steve had us go around the room and all 260 took an opportunity to introduce themselves. Actually, not all 260 were in the room… but they did have the opportunity and it was a great way to quickly learn of several people you might want to connect with. Brief bios of all the speakers are on the website. Check them out. It is an impressive list and for many the annual conference is like a big family reunion. The first conference had 45 people at a dude ranch with a really big hot tub. In those days it was about avoiding bad guys. Now, it is much more finding companies that will help create a better future for investors, society and the environment. In addition, now funds have positive performance histories. New sales come from clients wanting SRI, instead of financial advisors pushing their/our values onto client. Now it is coming from the grassroots, from the heart of investors all around America and beyond.